The Ayurvedic foot massage offered here is a powerful healing full body massage that works on both your physical and energetic bodies. The massage and treatment session starts with an application of warm, Ayurvedic medicinal oil all over your body. Then you are thoroughly massaged by Bev using her feet. The strokes of the massage flow continuously from your finger tips to your toes. The sequence of strokes is very precise as it follows a well-defined system of nadi-energy pathways. If required, Bev can manipulate your joints and muscles as well as work with marma/pressure points. At the end of the session, with her hands she massages your head & face with another specially formulated Ayurvedic oil. Each session lasts 90 minutes and costs £65. In Indian Ayurvedic Centres, this type of massage is usually administered on 7 consecutive days. The effect is very intense and the patient has to rest during this period. In England, by experience Bev has found that 7 massages taken over a period of 3 weeks can be very effective. A massage taken regularly every 2-3 weeks also works well. A one-off massage makes an excellent treat! (i) Our body's constitution is governed by three 'doshas'. The doshas can be thought of as forces within the body that are composed of the 5 elements. These doshas are vata (air and earth), pitta (fire and air) and kapha (water). (ii) The body is composed of energy pathways called 'nadis'. These nadis carry 'vayus' or 'energy winds' which are responsible for how our body functions. If the body's vayus are not flowing freely in the correct nadi pathway then imbalances occur in the doshas and in the first instance we will not feel well or may experience pain. In the long term, disturbed doshas give rise to disease. Our doshas and elements can become unbalanced and disturbed by physical, mental and emotional problems as well as by stress, poor diet, pollution, environmental conditions, etc. The energy pathways or nadis have very precise routes within our energetic body and these pathways intersect with our physical body at 'marma points'. Marma points can be thought of as similar to acupuncture points. The precise sequence of strokes used in this foot massage follow the nadi-energy pathways to achieve a re-balancing of the 3 doshas. This process is aided by the medicinal oils I use and by working with marma points at the interface between your physical and energetic bodies. - bringing you to a state of present awareness deeply rooted in your body. - build strength in the body. 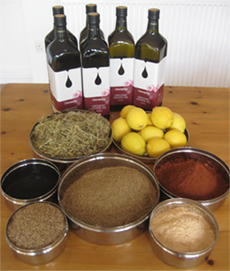 Bev prepares the body oil using Indian medicinal plants, spices and powders. The base oil is a locally bought organic sesame oil. Sesame is used as the base oil because it is very effective at absorbing the plant essences, it is also heating for the body which is important in 'cold' climates. The oil takes 2 days to prepare; on the first day the dried plants are reconstitued by boiling them for several hours in water. On the second day, the filtrate (kshaya) is mixed and boiled for 3-4 hours with the other ingredients (spices, powders, sesame oil and fruit juice) until a 'dry' medicinal oil is produced. The small amount of medicinal head oil used in each treatment is prepared by Bev's teacher, P Vijayan. This oil is based on coconut oil and contains numerous plants (20+). It is best made using fresh plants. The preparation technique and recipe is a tightly kept secret within Vijayan's family.